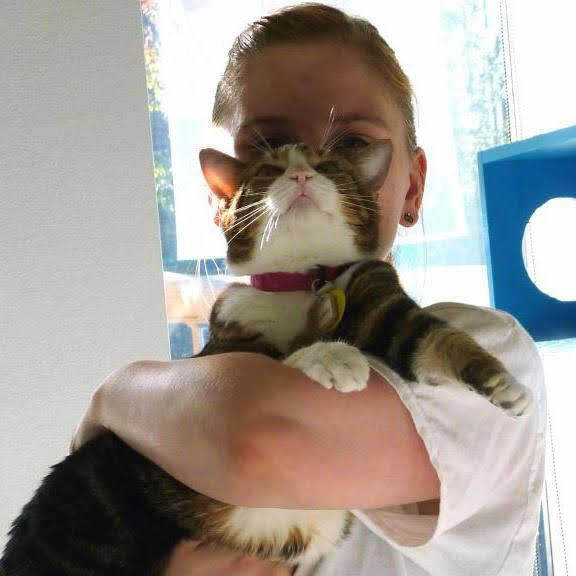 Volunteer of the Month: Rachael P. - Volunteer of the Month: Rachael P.
Volunteer of the Month: Rachael P.
It’s no secret that Cat Town has the greatest volunteers around. Rachael P. is an integral part of our team, helping with things like our Case Management Program and socializing members of our Forgotten Kitten Project. She even serves as an unofficial Cat Town ambassador, spreading the word about the organization to her Lyft and Uber passengers. I talked with Rachael about what draws her to volunteering and why she thinks families in particular should consider fostering. Without further ado, let’s get to know Rachael P.! Rachel uses play to help our Forgotten Kittens build confidence. Photo by Cathy Niland. Larissa C.: How did you get involved with Cat Town? Rachael P.: When I first moved to Oakland, my partner and our kitties were still living in Michigan. I visited Cat Town to get my kitty fix and then signed up to volunteer. After the volunteer orientation, I emailed staff begging them to let me foster since I had a completely empty apartment without furniture and wanted the company. Cat Town was happy to oblige! LC: Have you been a cat person your whole life? RP: Yes! I love animals in general—the complexity of cats just speaks to me more though. I enjoy a challenge and building a connection with a living creature. LC: Do you have cats at home? RP: My partner and I have three cats at home. Sweetie is our senior lady and my partner’s childhood cat. Fenrir and Mush Mush were our first and only #fosterfails. LC: What role do you play, or have you played, at Cat Town? RP: I strive to play any role that is most needed at the time. Primarily I volunteer in the Adoption Center Studios socializing cats and support Cat Town’s Case Management Program. Additionally, I try to support staff with research and capacity building efforts to best serve our kitty and human community. Cat Town offers many diverse opportunities to volunteer. My experiences have ranged from fostering kitties, painting the walls, deep cleaning studios, and asking for in-kind donations. My favorite informal role is being a Cat Town Uber/Lyft ambassador. About 75% of my rideshare rides become a pitch for visiting Cat Town and sharing information about the mission. Anyone can do it and it is a guaranteed conversation starter! LC: What do you love most about volunteering? RP: I really love the human/cat community and the environment at Cat Town. Although each day brings highs and lows, I am always inspired by the dedication and passion of the staff and other volunteers. Additionally, I enjoy listening to people who have been to Cat Town and its impact on their life. Last week, a woman told me, completely unprompted, that she asked her potential dates if they would like to go to Cat Town for their first outing. She said it was a great test to see if the date had long-term potential. How many places can have that same claim to fame? LC: You’ve done a lot to help socialize members of our Forgotten Kitten Project. What is something you’ve learned about under-socialized cats and kittens that people might not expect to be true? RP: Generally, people do not expect under-socialized cats and kittens to become more socialized in our cage-free setting. While the Cat Zone concept may not work for every cat, it does simulate an intense version of a bustling home environment. Socialization is more effective when there are more confident cats for the less confident cats to learn from. There are some amazing examples like Suzy! When she first arrived, I sat with her in the studio space and offered her treats. She was very fearful. When she moved to the Cat Zone, she made significant progress. LC: What is your favorite thing about working with vulnerable shelter cats? RP: Seeing the progress! Every cat is so different and needs their own approach. Sometimes the kitties are agitated in the shelter and just need a new environment. Other times kitties may be easily overstimulated and might benefit from food puzzles or clicker training. Each adoption is a celebration. LC: Why would you encourage people to adopt an under-socialized cat or kitten? RP: Two of our kitties were under-socialized kittens. You build a stronger and more intimate bond with these kitties. There are so many special landmark moments: the first time they eat in front of you, the first time they lean into your hand for cheek scratches, the first purr, and watching them become more confident every single day. LC: As someone who has fostered for Cat Town, what would you say to someone who’s interested in fostering a cat, but hasn’t fostered before? RP: Do it! Frequently people tell me they could never foster because they would love the kitty too much to let them go. Fostering is one of the most powerful experiences you can have because it is entirely about investing your energy into a cat who is eventually going to their forever home. This act teaches another type of love—it is about patience and knowing you are impacting a life without necessarily directly benefiting from your efforts. I highly recommend fostering to families with kids. It is a great way to teach children responsibility and how to compassionately interact with different cats. I started fostering as a teenager and I still cry every time I say goodbye. It is worth it every single time. Interested in joining Team Cat Town and helping us save Oakland’s vulnerable and under-socialized cats? There are many volunteer opportunities available, including helping with transportation, outreach and adoption events, fundraising, and more! You can start with completing a volunteer application form or emailing info@cattownoakland.org to see how you can get involved and start making a difference today.